Bouvier des Flandres Cattle Dogs! Now this dog is actually one of my personal favorites when selecting a breed of dog. When properly groomed this animal has to be one of the worlds most beautiful dogs. The Bouvier is another of the herding dogs that we have previously discussed except that this time the canine originates in Flanders. These dogs were originally employed for farm work which included cart pulling, cattle droving and sheep herding. Today the dog no longer is required to work hard and long days tending their flocks but rather they are principally used as either a guard dog or perhaps as police dogs. They are excellent animals to keep as a family pet which has greatly boasted their popularity. The name Bouvier des Flanders is French and translates to "Herder of Flanders" referring naturally to its purpose and origination point. 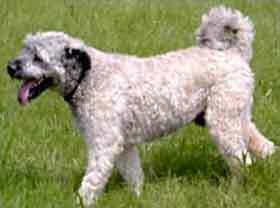 This is one of those dog breeds that was purposely interbreed amongst several breeds of dog such as the Irish wolfhounds with various local Flanders farm dogs. This mixing up of the various breeds continued until they ended up with the modern day version of the Bouvier. He is a total working animal that is able to continue his task tirelessly as he herds or guards his cattle. In a pinch he is strong enough to even pull a small cargo cart if he needed to. He has a mild temperament and can withstand extreme variations in weather conditions. It was thought that during the First World War the breed had completely died out. This was primarily a result of using the dogs for military purposes as well as the devastation that was being caused upon its homeland of Flanders. In appearance this dog is a powerfully built animal with a rugged appearance. Its extreme looks can usually scare a would be burglar when they are used as guard and watch dogs. It is a fairly heavy dog and tips the scales at between 100 to 120 pounds. Their color variations include fawn, grey brindle, black or what commonly called "pepper and salt" color. With their heavy hair coating they generally require a complete weekly brushing to ensure their coats are mat free. In addition it usually requires a trimming just about every 3 to 5 weeks.